At the end of the development efforts to support true Model Driven Design there are some elements you just don’t want to store in another metadata table. But somehow you need specific information which isn’t available in the Data Dictionary either (or directly derivable that way). In my case I wanted to label attributes within a Dimensional Model to behave following specific paradigms for presenting history – Type0, Type1 or Type2 – and essentially use this information to be queried by the ETL automation logic. The goal is to automate the ETL from a Data Vault model into a typical Star Schema for different use-cases related to time variance. We were already able to generate the rest of the Data Warehouse using the defined patterns for Data Vault and any sourcing patterns we encountered. The best solution in this scenario is to extend the table and/or column definition in the database with configurable elements, which can be defined as part of the modelling effort and consequently be read by querying the Data Dictionary. This would allow the Model Driven Design to be completed; different ETLs on the Data Vault model for a Star Schema could be generated using information captured in the model itself. For this purpose I used ERwin 9.5 (Community Edition) with SQL Server 2012, although this works on similar products such as Embarcadero ER Studio as well. 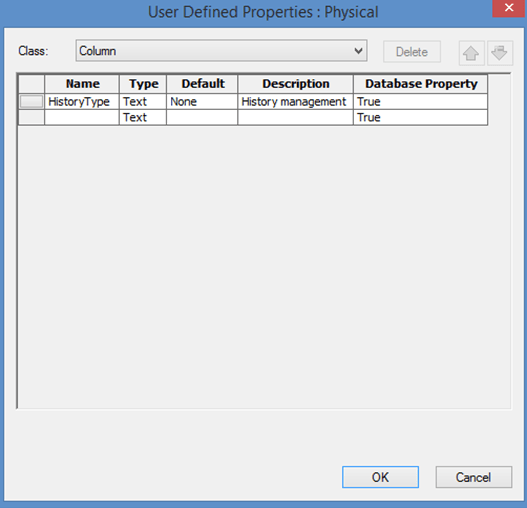 In ERwin, go to the Column Properties and navigate to the UDP (User Defined Properties) tab. In this tab you can create a type for anything you want, which in our case is a ‘HistoryType’ label for each column with the default value of ‘None’ and a type of ‘Text’ as the contents are string values. Creating this UDP allows you to set a HistoryType for each individual column. Lastly, UDPs / Extended Properties can be defined for a large variety of objects including, but not limited to Indexes, Views, Tables, Schemas, Functions and even databases. For ETL automation and development, this saves a massive amount of time otherwise spent creating Source-To-Target mappings or repositories to store this type of content.